Please help me get rid of these baby teeth on teen Justin! What teenager has these tiny baby teeth? I've tried unsuccessfully to make the teeth larger to fill in the gaps. The size morphs move all the teeth but don't adjust the gaps. 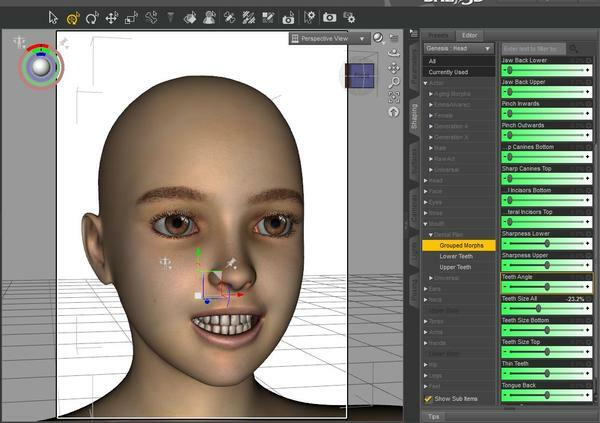 The gap morph only moves the top two teeth. Any ideas? Thanks for the suggestions. I think I'll have to wait for the Zev0 product; it looks very versatile. The ShareCG one says it only works on the two upper front teeth, but I want to fix all of the teeth. Unfortunately I don't have Hitomi, so I can't try that. The only thing I've been able to do so far is dial down the Justin head and dial up some other head. Of course that changes the whole head shape. You might also want to send a shout to sickleyield at rendo and ask if her fantasy tooth morph pack for genesis would help. http://www.renderosity.com/mod/bcs/sickleyields-fantastical-teeth-genesis/91791 It seems to be mostly fangs and stuff, like the sets in the creature creator, so I haven't picked it up yet, but if she says it'll help, it's only $5. Thanks, it looks like a possibility. I sent SickleYield a PM to ask. The Zev0/DragonStorm product is coming in January, and they think it will solve this problem, too. Dental Plan looks great. It would be nice to get a $5 fix ASAP. I'll see what Sickle Yield has to say, if I get a reply. Otherwise, Justin will just have to keep his mouth closed to avoid embarrassment until January. Here she used the Thin Teeth morph combined with the Teeth Size All morph. Do both the male and female teen have this teeth problem? Yes, but Julie is not as bad. Hiro 5 has the same morph, so if you have him you can try this too. ...and another render using the teens. 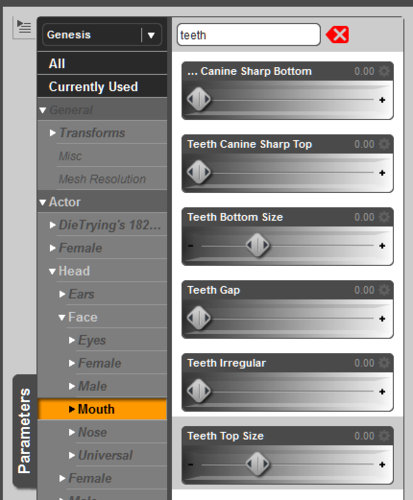 Incidentally, that's basic Julie with the Teeth Smoother modifier set to 0.4. The following is Justin, who requires a bit of a stronger setting. This is at 0.65 on the Teeth Smoother. Yeah, the one thing to remember about the smoother is that it's designed to give more of an anime look to the mouth, , so it moves everything towards a single uniform size to create the classic anime "dental horse shoe"shape. It helps a lot in a case like Julie and Justin, but comes at the cost of a lot of the character you get with bigger front teeth, sharper incisors, etc.. Dental Plan is obviously a better solution overall, and everything else is just a stop gap. 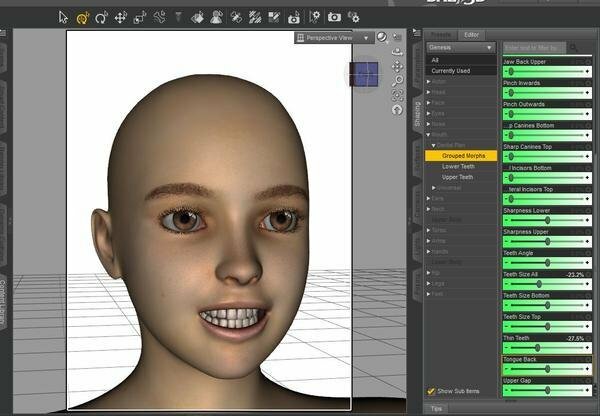 I wish they would have put a teeth smoothing morph in the teens, like in Hiro 5 and Hitomi. To be frank, it's a little disappointing we need to resort to any kind of workaround just to make the teeth look normal, much less purchase an entire new set of morphs for the task. Still, Hitomi's teeth smoother will suit my humble needs for the moment. I do secretly hope they'll release an updated version which fixes this issue though. How do we encourage the vendor(s) to fix this? Is a Mantis bug report the way to go? Is there a better way? Not sure what to suggest. Perhaps a ticket. Or track down Thorne here on the forums and send he/she a PM about it and direct the person to this thread making sure you include the thread count number where the complaints started. Not sure what to suggest. Perhaps a ticket. Or track down Sarsa here on the forums and send he/she a PM about it and direct the person to this thread making sure you include the thread count number where the complaints started. Right... found the thread and found that I was wrong about the merchant. Sorry about that. Corrected above with a link to the thread where the WIP's were posted. PM away! I certainly hope not Z!